Laurel and Hardy are one of the more famous on-screen duos in the history of cinema. With a career that started near the advent of sound in motion pictures, they starred in over 100 films together before having a falling out over contract issues with Hal Roach Studios. 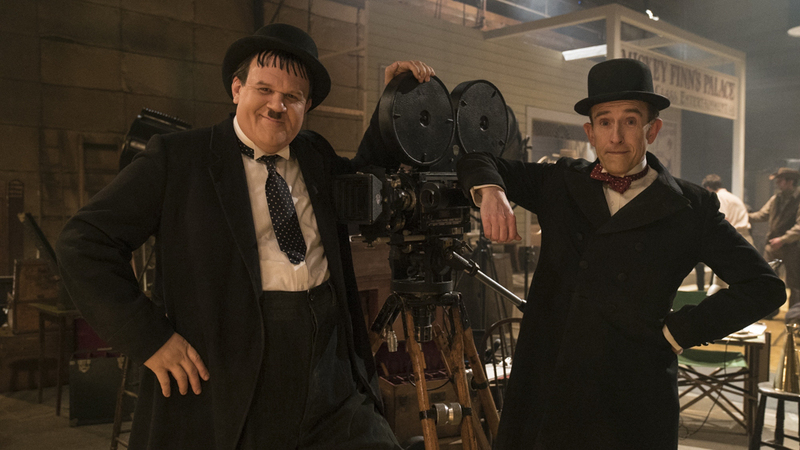 Jon S. Baird’s STAN & OLLIE foregoes the usual biopic framework to focus on the last attempt to achieve their success some 16 years later on a long UK tour. As they arrive at their starting point, Stan Laurel (Steve Coogan) and Oliver Hardy (John C. Reilly) are hoping to revive their careers, as well as some of the magic they had as an act that had been lost since filming WAY OUT WEST in 1937. The duo will do their bits on stage to various audiences, while also working on a Robin Hood picture that Stan has been trying to pitch to a London film producer, trying to get back that former glory. More to the point, that is the entire reason for STAN & OLLIE, as viewers get a glimpse into the two men that inhabited their on-screen personas. They’ve been Laurel & Hardy for so long that there is no respite in their real selves, a lack of realization that they are now just Stan & Ollie, especially Stan. He uses every opportunity to do a gag or put on airs, which comes in handy as they do publicity stunts to generate buzz for their shows. Their current success grows, but they fall back into old habits that ultimately did them in in the first place, such as Hardy’s penchant for bad gambling. John C. Reilly, left, as Oliver Hardy and Steve Coogan as Stan Laurel in ‘STAN & OLLIE.’ Courtesy of Sony Pictures Classics. They show more desperation than hope on their famous likenesses, coming to the realization that they don’t get the perks they used to, nor do they get the houses they have become accustomed to. Life has passed them by for the likes of Abbott & Costello, and it’s going to take more than what was assumed. Laurel & Hardy remained consummate professionals but still had unresolved feelings toward the other since their split. Is this another success on the horizon, or is it just a final curtain call that helps settle their differences? The biggest hurdle in making STAN & OLLIE is figuring out how to get a modern audience to relate to a hit act from 90 years ago. Fortunately, director Baird and Oscar-nominated screenwriter Jeff Pope (PHILOMENA) have a multitude of ways to get them to understand and connect. For example, they open the film on a long take as Laurel & Hardy make their way to set, with Stan talking business and Ollie talking about life; right away the audience understands their dynamic and lays the foundation for their conflict. More so, the story acts as a conduit between the cinematic world and the audience. Laurel & Hardy make their way through towns, having a blast and remembering how good they were, and their fun is contagious for the viewer. But then real life enters into the picture in the form of their wives Lucille Hardy (Shirley Henderson) and Ida Laurel (Nina Arianda). That reality exacerbates the issues they were avoiding, and the script moves through cynicism and terse conversation to get the audience to shift the emotional perspectives. However, none of this film would have been successful without the talents of Coogan and Reilly. They embody their characters, while using their facial expressions to create a division between the act and the truth. Furthermore, recreating their acts on screen not only folds into the story, but gets the audience to either remember their comedy stylings or see it for the first time. There are also intimate moments to improve the audiences’ connection to the duo, whether letting them in on the creative process as they write their Robin Hood movie or just by Stan referring to his counterpart as Babe, which was Oliver’s real nickname in inner circles. 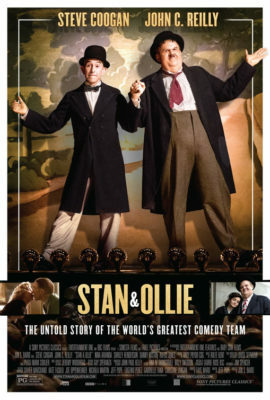 STAN & OLLIE is a well-crafted insight into two of Hollywood’s most recognizable personalities, anchored by fantastic performances from Coogan, Reilly, Henderson, and Arianda. Nothing about this movie comes off as melodramatic or forced, however the resolution could’ve taken a little more time. Regardless, it’s absolutely charming and one of the best biopics to come out in the past year. STAN & OLLIE is now playing in limited release. Check your local listings to see where it is playing near you.